The Rás Tailteann is an annual, eight-day, stage race around Ireland covering over 1,100kms. The race is Ireland’s number one cycling event with participants, both professional and amateurs, from all around the world. 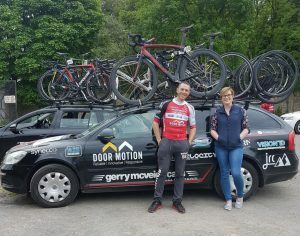 SEFtec NMCI Offshore (SNO) have sponsored the “Gerry McVeigh Cars Doormotion” team, pictured here at the beginning of the week. Also pictured is SNO’s Ruth Murphy with Ciaran Murphy, taken after Stage 5, Glengarriff to Mitchelstown yesterday. 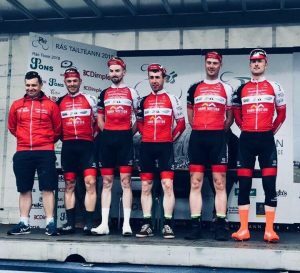 Today the team travels 155kms from Mitchelstown to Carlow for Stage 6. The race finishes on Sunday in Skerries, Co Dublin. Best of luck to all the team! Need to book a PST in time for the Rolex Fastnet Race? Are you a crew member on one of the 400 boats taking part in this year’s Rolex Fastnet Race? 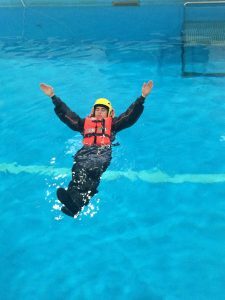 Have you completed a Personal Survival Course? If not, don’t worry, we have added an additional date to our schedule due to demand!